I made some pj's! This is a Burda pattern re-release 7109. I just love how vintage kitschy it is. They definitely don't sell this kind of lingerie in stores anymore! I used a silk/cotton blend in a yellow floral print, that I got on sale at Fabricland. It is very sheer so I underlined the front of the bodice in a yellow voile I had leftover from a dress lining. The pj top is sort of a bell shape and very lose, the bottoms are bloomers with elastic around the thigh! I didn't put sleeves on it, I thought it might be annoying to sleep in. The edges are finished with a bias tape, also made from the yellow voile. For all the seams I used the french finishing, for a nice clean look. 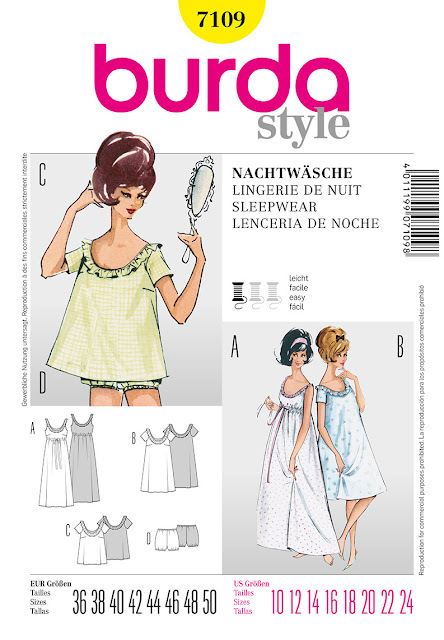 This was my first Burda pattern, and I was not really impressed. If I needed to use the directions I would have never finished this project. I'm still not sure how they wanted to attach the ruffle, so I just did my own thing. Definitely not for beginners, based on the directions alone. Why can't they just be clear! So these are really comfy and cute for summer. If only I could get my beehive on like the illustration then I would be really cute! Awesome! I really love the curlers and slides too, LOL! Even if you don't look like the fashion photo you still look adorable! What cute pjs! I think they're super cute. I want to make a pair of bloomers now! Super cute - I used to have some like this when I was 8 or so (and I am not that old! I loved them - time to make some new ones I think!! That is so so cute!! I have about a million pairs of pjs, but I might have to make some more! Aw, so cute! 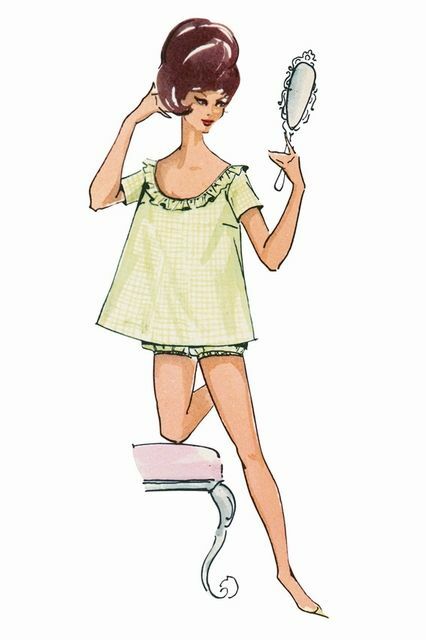 I just love 60's sleepwear. Very Cute! I love making sleep wear too!